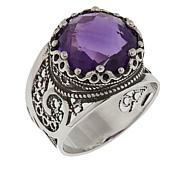 Bring to your jewelry box a bold look inspired by the domes of holy places in Istanbul. 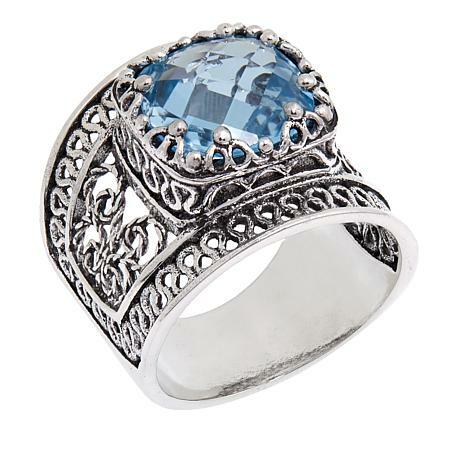 A designer, wide filigree band with unique side embroidery and crown-set, cushion-cut blue topaz create one exceptional ring. This accessory is destined to reach new heights. Beautiful but runs extremely small. Ordered my usual size and am returning because it is too small, do ordered next size and am returning it also because it is uncomfortably to wear , too tight! 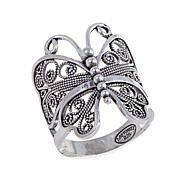 The blue in this pretty ring looks great with chambray and with jeans. The filigree is wow. 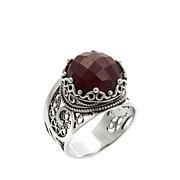 Love this ring so much I got it with different stones! 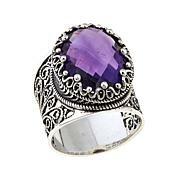 The stone is cut beautifully and it is very pretty while wearing (bought as a Christmas present for my Mom). I do recommend it but somehow I expected the craftsmanship to be a bit better. From a distance it looks perfect. When you look close, it looks a wee bit cheap.